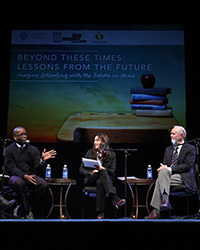 In a continued partnership with the Golden Apple Foundation and National Louis University, Chicago Shakespeare Theater is hosting the education forum series Beyond These Times: Reimagining School—a free two-part symposium bringing together leading futurists in education to address what school in the future must look like to prepare students for rapid advances in technology, globalization, and economy. The series is moderated by WBEZ arts and culture reporter Alison Cuddy. The second symposium, coming up on Tuesday, May 21, will feature Tony Wagner, author of Creating Innovators: The Making of Young People Who Will Change the World and The Global Achievement Gap, and Constance Yowell, Director of Education at the MacArthur Foundation. Wagner is the first Innovation Education Fellow at the Technology & Entrepreneurship Center at Harvard and founded the Change Leadership Group at the Harvard Graduate School of Education. Yowell leads MacArthur Foundation’s digital media and learning initiative which aims to determine how digital media are changing the way young people learn, socialize and participate in civic life.